We will find our champion app today. 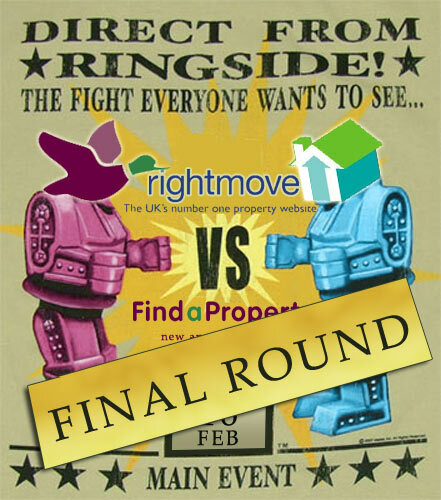 The contenders are FindaProperty and Rightmove. Today is round 7. The Final Round. With a seller hoping to attract buyers, which one claims the highest visitor traffic in the UK and thereby is most likely to have proportionately more buyers viewing? Though stats for the apps aren’t currently available we decided the main site would serve as a good barometer. Verdict: Rightmove is likely to have more UK buyers using the app long term. The Rightmove app does seem to have a few more properties on offer, even though it only provides a hundred and unfortunately crashed on both occasions. FindaProperty seems to work more quickly, and provided a faultless experience. If Tepilo can have the usability of both, the stability of the FindaProperty app and the results of Rightmove without crashing, it could become a new challenger, but for now I’m keeping both on my iPhone as they are both great apps.